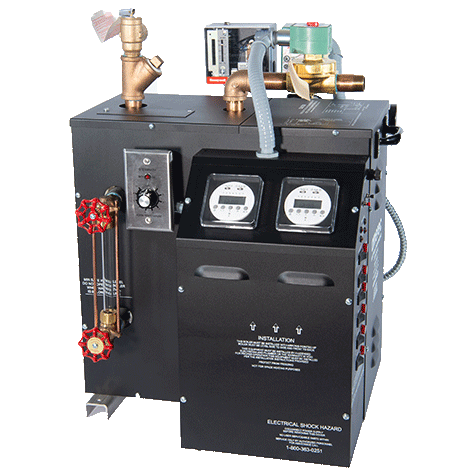 AI boilers feature all-steel construction with powder coat exterior, brass fittings and stainless steel feet to prevent corrosion. Designed to minimize downtime, AI boilers are easy to access and service, with integrated diagnostic systems alert you to any problems using LED indicator lights. AI boilers come with multiple safety features to minimize service costs and downtime. Standard features include water level sight glass, 3-level water sensing system with low water cut off. IT thermostats (1 for one room installation, 2 for two room installations) are temperature controls designed to be easy-to-understand and use. A separate thermostat is required for each steam room. Being able to consistently offer your customers the highest quality steam bath experience is always a good investment. With additional controls and time and cost-savings accessories, you can enhance quality even further while minimizing maintenance time, effort and expenses. Thermostat for 1 room installation. 7-Day Time Clock with 2 hour on/off segments. 24-Hour 7-Day Digital Time Clock with battery backup. Thermostat for 2 room installation. 60 Minute Timer to control steam flow in steam rooms with intermittent use. 24-Hour Time Clock with 30 minute on/off segments. In-Room “refresh” control for a quick burst of steam delivered on demand. Polished Chrome steamhead for use with AI series boilers. A drain and flush system that automatically performs recommended daily draining and flushing of the boiler tank to reduce build-up of solids such as scale and sludge. Uses a computer controlled drain cycle to add and drain water in steps, rinsing the tank and draining water at or below 140° F. Available with optional Digital Run Clock and is installed at the factory. System With replaceable cartridges featuring a ScaleX2 filter to reduce scale build-up common in boilers. The ASX200 will also reduce chlorine and sediment from water by trapping particulates in a second filter as water passes through. The steam door features 1/4" tempered glass with a sturdy aluminum frame, excellent for high volume use commercial applications. Optional 1" insulated glass panel provides increased thermal efficiency. Push-pull handles and hydraulic closer included. Door is 36" x 84"; frame size is 391/2" x 853/4"
Hydraulic closer included. Closer to be mounted on exterior side of door. Push - Pull handles included. 313/8" x 701/8" clear 1/4" tempered glass. Optional 1" insulated glass provides increased thermal efficiency.